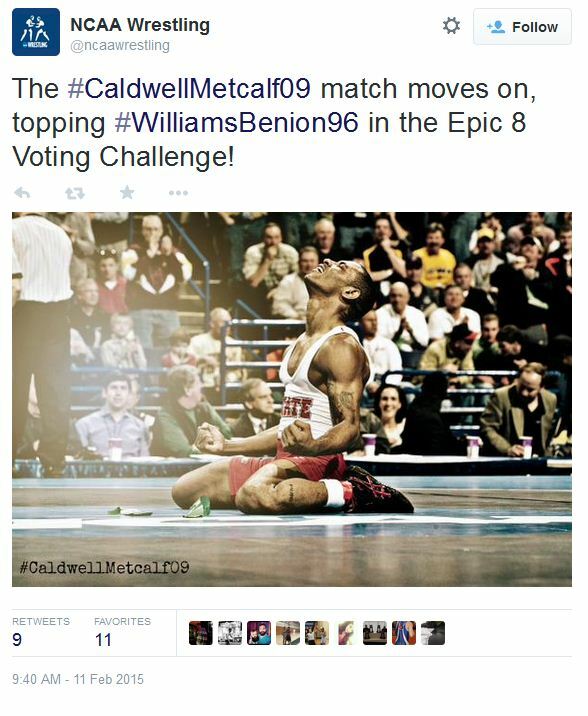 In Round 1, “The Upset” took on “The Final Escape” and #CaldwellMetcalf09 claimed victory. A year before this historic matchup between Illinois natives, Benion shocked the field in 1995 by winning the national title as the No. 7 seed at 158 pounds. Williams, who like Benion was from the Land of Lincoln, would win the first of his three championships knocking off Benion in the finals. With Williams leading 6-5, he countered a Benion shot to extend the lead to 8-5 with 50 seconds remaining. The defending champ Benion got free and tied the match with 14 seconds left with a takedown. An escape by Williams with six seconds to go proved to be the winning point.